75 years ago yesterday, the Nazis guillotined a courageous group of German students. They called themselves The White Rose and formed in opposition to the abhorrent policies of the Nazis. An Op-Ed in the NYT this week remembers these heros. It tells that "the members of the White Rose declared that all those who stood by were complicit and implored all citizens to engage in 'passive resistance' to the Nazi state." These brave resistors, it describes, were "a flickering flame in the darkness." For the past few weeks, our Torah has been explaining how to create a dwelling place of God, the mishkan. We are given the exact dimensions, the exact vessels, the exact way to maintain it and how to make offerings. And those instructions continue this week. The first line of our parsha instructs the Israelites to bring clear olive oil l'ha'alot ner tamid, to keep a flame constantly burning above the ark. Though it is the priests' responsibility to physically maintain the flame, it is a communal effort. Without the Israelites bringing the oil, the lamp cannot continually burn. In the following verse, we are told that the responsibility to tend the flame is on Aaron AND his sons. Not just the adult, but the youth too. And this week, during the 75th memorial of White Rose's execution, and during a week in which the youth in our nation stood up to "the man," it seems serendipitous to read about an eternal light tended by youth. It seems prescient to read about Aaron the adult, and his youthful sons, and the whole of the people Israel, being partners in creating God's dwelling place. This week, in the aftermath of the tragedy in Florida, a new group of students took the stage. Smart, Ferocious, Determined. These students would not allow 17 of their classmates to die in vain. Not this time. This time, change was coming. This time would be different. You see, these young adults refuse to accept the broken status quo. The status quo that all of us have gotten used to. The status quo of regular mass shootings, of murdered sons and daughters, of loved ones and classmates. No, God does not dwell in this status quo. God does not dwell in a world where machines of war gun down schoolchildren. God does not dwell in a world that places gun rights above a child's right to life, a child's right to learn, a child's right to be a child. Yesterday, a 5-year-old in our congregation asked their mom if they could make a cut-out of a security guard to put in the window to scare off bad people. This is the world we're living in. But we can do something about it. The framework of Leviticus teaches us that without human involvement, human action, human prayer, God doesn't magically appear. Much like the ner tamid, the eternal light, without communal support it burns out. BUT! - WITH - communal help, with communal action and involvement, the light burns bright and our world once again becomes a dwelling place of God. The Rizhiner Rebbe taught: Let your light penetrate the darkness until the darkness itself becomes light and there is no longer a division between the two. As it is written (Genesis 1): And there was evening and there was morning, one day. These students in Florida have ignited a bright light across our country. Whether you relate to the adult in Aaron, or the youthfulness of his sons, or the communal obligation of Israel - we all have a role to play in maintaining the light of change. If you want to get involved in Gun Violence Prevention, please drop me a note. 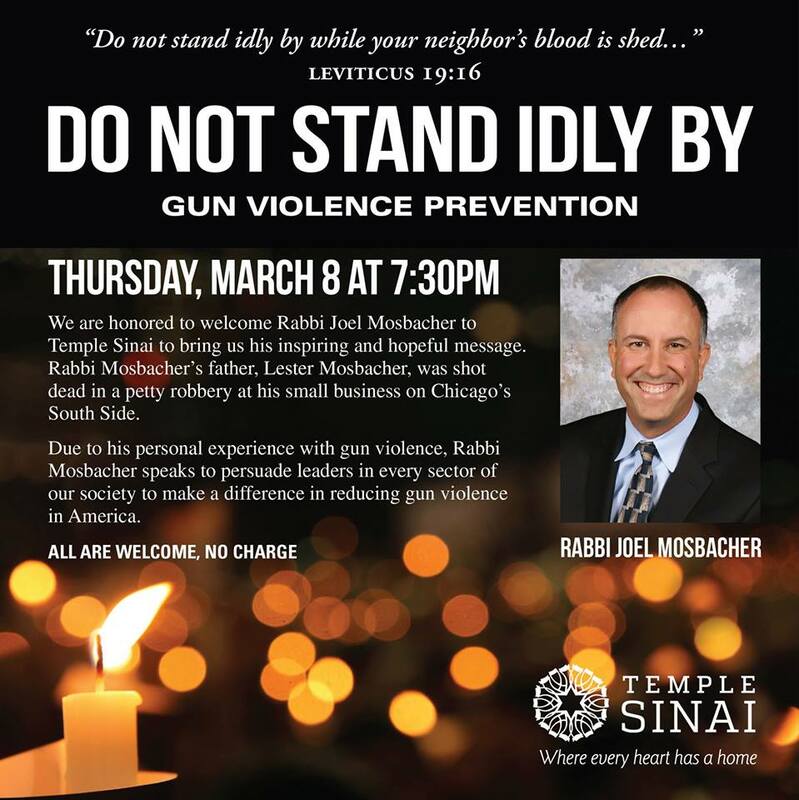 If you are on Long Island, join Temple Sinai on March 8th at 7:30 to hear Rabbi Joel Mosbacher speak. Check out the March for our Lives on FB and find where and when your local rally will be. Sign up for information from Gabby Giffords or Moms Demand Action or NFTY Fights for Gun Violence Prevention. Call Congress and get involved with Everytown for Gun Safety. So many options - pick one or two or three and change the world.